Color: Greyish brown or reddish brown with pale fur on their belly. Characteristics: Short fur over the body and longer fur on the tail. Size: They are 17 to 27 inches long. 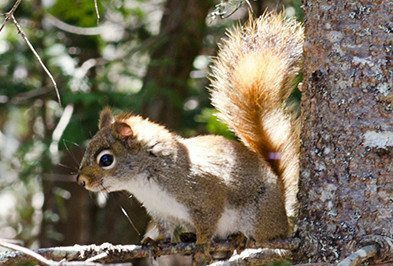 The most common squirrels in our area are Gray squirrels and Fox squirrels. Gray squirrels are about 17 to 20 inches long. They are greyish brown in color with a pale colored belly and long silver tail. They have short hair over their body and longer hair on their tail. Fox squirrels are reddish brown in color. They are about 17 to 27 inches in length. They have long claws for climbing trees and getting nuts. Why Do I Have A Squirrel Problem? Squirrels do not often enter homes but usually live in trees outside. When they enter a home it is to find shelter and food. If they can find a place to hide out in your home they will become more frequent in your home. Yes, squirrels do nest inside. If they can find easy access to your home and access to food squirrels will begin to build a nest. This usually happens in attics, crawl spaces or within walls. What Kind Of Threats Do Squirrels Pose? Squirrels pose a threat by their destructive behavior, contamination of food and spreading health hazards. When squirrels start chewing through materials like insulation and wiring it can cause a fire hazard in your home. If these squirrels get into your food then can contaminate it. These pests can also bring in other pests like fleas and ticks. How Can I Tell If I Have A Squirrel Problem? The most common way to start noticing a squirrel problem is to hear it. When these squirrels start to nest they will chew through home materials. You can also hear them crawling around in the walls. How Do I Control Squirrels? The best way to control these pests is to make sure the exterior of your home is sealed tight so they cannot find a way into your home. This can be cracks and gaps in siding, foundation, venting and wiring. How Do I Prevent Squirrels? The best way to prevent squirrels in your home is to call a professional pest exterminator for help preventing current pest problems and eliminating any future pest problems.